The Interior Ministry these days is spending quite a lot of time fixing problems created by fake notifications being circulated on social media. 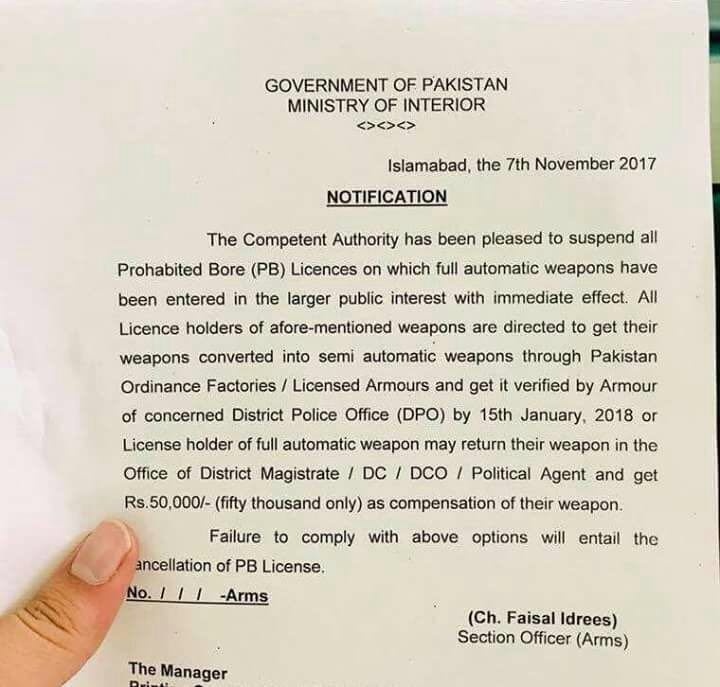 Two days after leading publications claimed that the Interior Ministry had banned licenses for all automatic weapons, an official statement has been released. The Ministry says that the news about the suspension of licenses of prohibited bore weapons is fake. The fake notification was first circulated on various social media platforms and finally the mainstream media reported about the suspension of firearm licenses which created confusion among the viewers and readers. The Ministry, in a statement, clarified that the matter of regulating arms, especially automatic arms, in the country is still under consideration. It further said that the media will be duly informed regarding any progress on the matter. According to the fake notification, the owners of automatic weapons would get their firearms replaced with non-automatic firearms or get Rs. 50,000 in return for handing over their semi-automatic firearms to the district administration. The deadline for the submitting the firearms was mentioned as January 15, 2018. Earlier this month, a fake notification about announcing Iqbal Day as a public holiday was circulated on the social media and was later picked up by the mainstream media. After this fake news about Iqbal Day became viral, the Ministry of Interior had to deny the fabricated notification. Such fake notification contain all the signatures and use the official format which makes them seem like an official notification. At this point it is unclear that who is involved in the fabrication of the notifications or if the authorities will be able to take any action against the culprits. It was a draft. Not notified. So it can’t be called a notification. So there is nothing fake about it. And there was no notification about iqbal day. The paper that was shared on social media was in fact the noting side of the file, that is part of official record and it’s not notified like this…….. So, We can safely call this news a fake one.